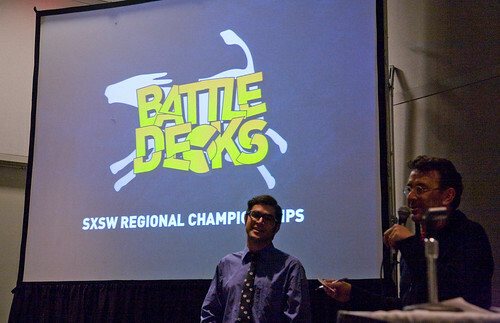 Battledecks is making its triumphant return to SXSW Interactive this year, taking place on Friday March 12th at 3:30pm. Hosted by Mike Monteiro, Battledecks is like an Improv PowerPoint Karaoke, where speakers give talks to slide decks that they have never seen before and then are judged by a panel of “experts”. Battledecks is a fast-paced, fun, laugh riot where “contestants” have to put together a presentation on the fly as slides are randomly projected for their confusion and the delight of the audience. Contestants are then judged by a panel of low-level celebrities, who can be bought. Battledecks was performed at SXSW ’08, packed the room, and got great reviews. We are committed to having a diverse group of both contestants and judges. UPDATE: Here’s the official BattleDecks announcement.